For boxers Vitali Klitschko, Erik Morales and Winky Wright, promoter Klaus-Peter Kohl and broadcasters Steve Albert and Jim Gray, their day in the sun is rapidly approaching. On Sunday, June 10th they will join boxing’s immortals when they are officially inducted into the International Boxing Hall of Fame in Canastota, New York. 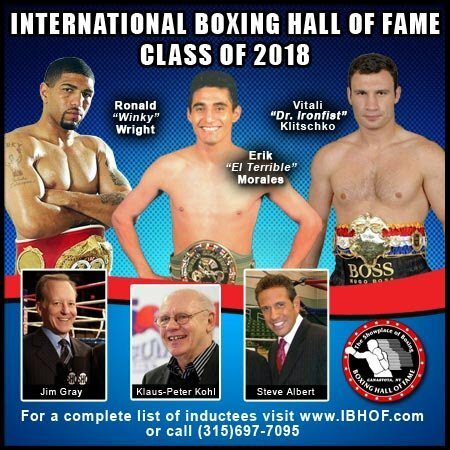 For more information on the Hall of Fame’s 29th Annual Induction Weekend, please call the Hall of Fame at (315) 697-7095, visit online at www.ibhof.com, on Facebook at www.facebook.com/InternationalBoxingHallofFame and on Twitter at www.twitter.com/BoxingHall.